H.R.H. Princess Maha Chakri Sirindhorn views the exhibits at the 11th Thai Astronomy Olympiad held at CMU Convention Center. The 11th Thai Astronomy Olympiad was held at the Chiang Mai University Convention Center on April 24, 2014 and H.R.H. Princess Maha Chakri Sirindhorn graciously presided over the opening ceremony. The event was held by the Promotion of Academic Olympiads and Development of Science Education Foundation (POSN), under the Royal Patronage of H.R.H. Princess Galyani Vadhana Krom Luang Naradhiwas Rajanagarindra in cooperation with the Faculty of Science, Chiang Mai University. The 11th Thai Astronomy Olympiad was held from April 24-29, 2014 at the Faculty of Science, Chiang Mai University. The Olympiad promotes astronomy in Thailand and Thai astronomers but was also held to coincide with the 50th year anniversary celebrations of the founding of Chiang Mai University and the 36th anniversary of Sirindhorn Observatory at Faculty of Science, CMU. Grade 5 students at Prem Tinsulanonda International School have had an exciting two months in the lead up to their PYP exhibition. 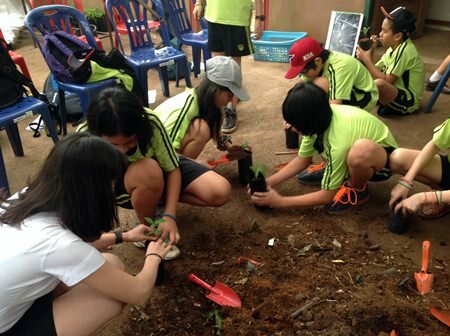 Whilst studying the theme of “Sharing the Planet”, students have taken meaningful actions in order to improve the world that they live in. These actions range from formulating their own recipe for dog shampoo for homeless dogs, designing video games to inform the public about what products affect endangered species, and organising a paper recycling programme for the Junior School. Throughout their Junior School career (up to seven years), students have been working towards their Grade 5 Exhibition, combining the skills that they have learned in all subjects across their schooling, to put together their exhibition. In groups of two or three, students chose problems they believed were significant to Sharing Our Planet, organised field trips and interviews in order to learn more about them, and finally worked out ways in which they could take action to help solve these problems. Rather than working as a class, learning about and solving a singular issue, students had more ownership over what they were studying. At this year’s Prem Grade 5 exhibition, there will be twelve different groups sharing their knowledge and the actions they have taken on issues, such as endangered species, pollution, child labour, animal rights, discrimination, energy use, deforestation, use of media and health. Students from schools in Chachoengsao, Phayao, Nan and Ubon Ratchathani visited Japan to present their astronomical research projects. Junior astronomy researchers visited Japan with the National Astronomical Research Institute of Thailand (NARIT), Ministry of Science and Technology to show their work on the international stage in a trip to Japan. This is the second such group that NARIT has to exhibit in Japan. NARIT wants to develop the potential of Thai students doing research at the school level, train advisers to enhance education, improve skills and experience of astronomical research and prepare to reform astronomy learning and teaching in Thailand. Saran Poshyachinda, NARIT Deputy Director took 7 junior researchers together with4 advisers from Benchama Raja Rangsarit School in Chachoengsao, Pua School in Nan, Chiang Kham Witthayakham School in Phayao and Hoksibpunsawitthayakom School in Ubon Ratchathani to present astronomical research in the Junior Session of the Astronomical Society of Japan 2014 at the International Christian University, Japan. They also presented their schools astronomical activities in Astro-High School Forum 2014 at the famed Waseda University, Tokyo, Japan. Saran Poshyachinda noted that this is the second time that NARIT has brought junior researchers of Advanced Teacher Training on the Astronomy Project to present their work in the Junior Session of the Astronomy Society of Japan 2014. This gives students advantages in kick starting their education and training in doing research and enables them to learn the process of systematic data collection and data analysis as well as public presentation. The seven projects that were selected for presentation were the results of research projects done by the students with teacher advice; the advanced projects used complex instruments and equipment. The students used the trip to study Japanese techniques as well as exchange knowledge and ideas with Japanese students giving the students inspiration for new projects. Sister Pensri Horae is joined by teachers and students for the announcement of the school’s first all-female Khon performance. Regina Coeli College, the only all-girl school in Chiang Mai, plans to hold their first all-female Khon performance in June. Sister Pensri Horae said that there will be two episodes performed by 116 students and teachers. Khon Prommas and Khon Yok Rob are the two episodes of the Ramakien that will be performed for the general public on Friday, June 27 at 5 p.m. Khon is a classical Thai masked show that interprets the Ramayana. Students have spent three months practicing for this elaborate presentation. A students only performance will be held at the school at 1 p.m. and tickets for both performances are 500, 1,000, 1,500 and 2,000 baht. Tickets will go on sale at the school in the middle of May. The performance of this important cultural dance is being held to give students a better understanding of their cultural history, to improve their artistic ability and to honor H.M. King Bhumibol Adulyadej. The funds raised will go towards promoting Thai cultural arts and musical and dancing skills for students as well as other important school projects. Call 053-282935 during school hours for more information.